thanks,btw what are compression levels supposed to be?im getting 150-160 across,hope thats good,now that i have the money for the right stuff,i didnt want my engine to be burnt out again.again,thank you.shoulda just bought the right stuff off the bat. is this a sufficent wide band? well i lost the bidding on the rrfpr,so can i use my vortech 1:1 fmu?didnt come with directions,bought it from a guy on neons.org.didnt think i could use it,just checking though. this is what i have.do i need a seperate fpr to set base,or should this unit do it? 5:1 does not equal "somewhere between 4:1 and 6:1"
i know its still half assed,but im working towards it.at least sumthing is coming through the block in my head.thanks for the help.btw,does it set base,or will i use my aftermarket fpr? yeah,that is the next thing im buying,should have thought this through better before doing it.do i need a feul pressure gauge or can i use my fpr after the sfmu?because when i turned it on it started chugging and blowing purple and heavy black smoke.feul right? would this be a good enough wideband?it'll be what i get.thanks for any help. cant get the sfmu to work,just shoots gas fumes out the pipe.do i need a stock fpr?or can i use my aftermarket 1?if so what do i set it to? There is nothing wrong with the vortech SFMU. It's exactly what you need. I used it for over a year. Rate of gain is adjustable. You don't need a beji. Make sure you have it hooked up right. The three screws will allow you to fine tune rate of gain, onset of gain, and vacuum bleed. so i dont need a stock fpr?or a fpr at all? The SFMU is an FPR. Its a type of FPR referred to as an RRFPR (rising rate fuel pressure regulator). Any FPR that raises fuel pressure according to manifold pressure is an RRFPR, even a 1:1. You may also see an RRFPR referred to as an FMU (fuel management unit), as is the case with the Vortech Super Fuel Management Unit (SFMU). There is no need to get over-technical with the terms. Almost everyone will refer to static fuel pressure as base pressure, so don't worry about the technical differences for now. You wont be setting base pressure with vacuum in your application. You need to use a check valve on the vacuum line so that the SFMU will not get a vacuum reference, only boost pressure. The stock PCM is designed to adjust injection time based on a fuel pressure that does not change according to manifold vacuum. For the best drive-ability when the engine is in vacuum, the fuel pressure should remain constant. Once manifold pressure rises above atmospheric pressure, the fuel pressure should begin to rise as well. There are two different springs available for the SFMU. One is for higher base pressures and the other is for lower base pressures. You will want to get the spring for lower base pressures. The SFMU includes multiple "tuning disks" to allow you to change the units base rate of gain. You best bet is to start with the 6:1 disk and adjust the rate of gain down with the "boost" bleed screw. This screw will give you the ability to fine tune the rate of gain. If you have to adjust the screw all the way and it is still too much rate of gain, switch to the next disk. You will never get an FMU fuel system to work prefect. 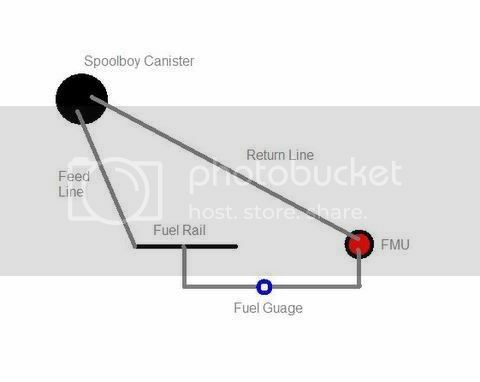 Its a crude way of adding the needed fuel when boosting an N/A engine, but it works for the most part. The only way to prefect the tuning is to use a programmable engine management system (such as MegaSquirt). with it in,and looking at my narrow band,when i try to accelerate,it stuters and backfires and leans out badly,so i put my other set-up back on(a 10:1 fmu and an adjustable fpr)and it still does it?did sumthin get f'd up?i opened the fpr and found lil metal shavings?! ?what happend to my fuel system?any ideas? don't know about the metal shavings, did you drill into your tank?